The Ballarat Vintage Tramway is located in the Botanical Gardens, on the western shore of Lake Wendouree. For a printable pdf version of this page see: Museum Info Guide. To see a map of our location, click here. Our grid reference is: 4C. Our depot is at:37 33'6"S and 143 49' 12"E. For a City of Ballarat Map of the Gardens click here. Take the Ballarat exit and pass through the city centre. Then travel along Sturt Street and turn right at Hamilton Avenue, which is about 3 kilometres from the City centre. 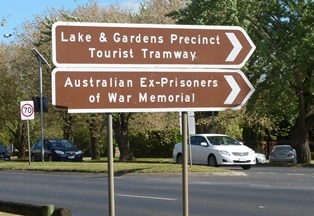 The Lake and Gardens Precinct - Tourist Tramway sign indicates the turn off. Take the Ballarat exit from the Western Highway and drive along Remembrance Drive and pass the Arch of Victory. Turn left at Hamilton Avenue which is about 300 metres past the traffic lights at Gillies Street. Signage indicates the “Lake & Gardens Precinct - Tourist Tramway”. Take a train from Southern Cross Station to Ballarat or Wendouree stations. If you look for "Ballarat Tramway" on Google, the "Get Directions" button on their entry for the Museum and then for public transport, we have found to be very good for services from Melbourne. For time table and other information go to the V/Line website at vline.com.au or the PTV website at http://ptv.vic.gov.au/ Your V/Line rail ticket includes metropolitan travel in Melbourne and travel on buses within Ballarat. Refreshments are available at Ballarat station. Wendouree Railway Station is an easy walk from the Gardens precinct. On arrival walk back, cross the railway and walk south along Gillies St and through the Gardens to Wendouree Parade or to our Museum / tram depot. The gardens are about a ten minute walk from the station and our depot is about 15 to 20 minutes away through the gardens. We suggest you walk along the Prime Ministers Avenue to the depot, or when trams are operating, catch a tram in Wendouree Parade. Bicycle accommodation is available on the trains and the lake is great to ride your bicycle around as well. 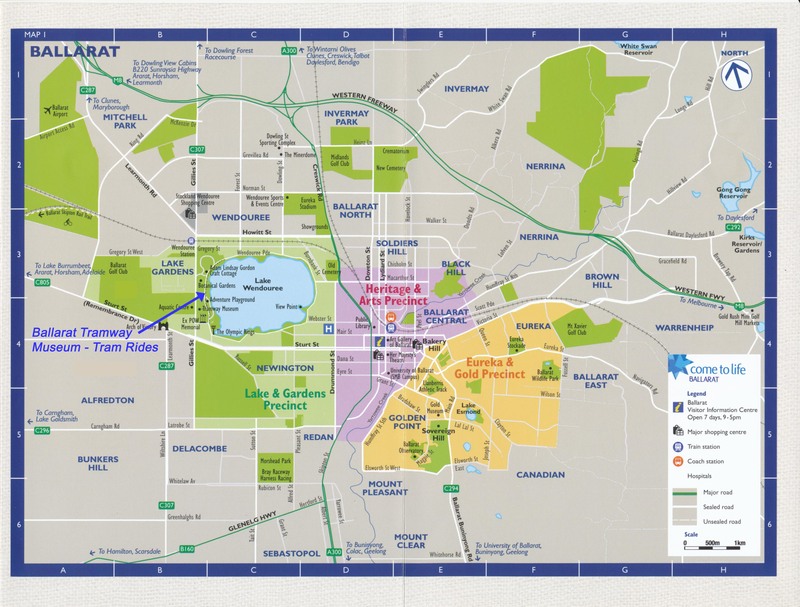 This route starts at the main Ballarat Railway Station and takes a tour via the two major shopping centres. It takes about 30mins to travel from the station to the bus stops in Gillies St for the Gardens including one immediately behind the Museum alight at the Botanic Gardens / Aquatic Centre Stop. You will see the Fish Hatchery - http://www.ballaratfishhatchery.com.au/ on your left. It is probably better to travel to the Wendouree Station and catch the bus from there if you wish. This route runs from the main Ballarat Railway Station, largely via Sturt St. Alight at the Victoria Park/Sturt St stop. We suggest you advise the driver when getting on the bus as the bus has to pull off the main road into a service or side road in order to stop at the bus stop itself. After getting off the bus, cross Sturt St and walk along Hamilton Avenue to the Lake and the Gardens, past the 1956 Olympic Games Monument. Our tram stop is at Carlton St in Wendouree Parade. This is also the location of The Australian Ex-Prisoners of War Memorial http://www.ballarat.vic.gov.au/lae/attractions/australian-ex-pow-memorial.aspx You will see the depot from the Carlton St. intersection as well. The bus trip takes about 15 mins with a further 10 mins walk from the bus stop. Links correct as at 20-12-2018.